This newly built 5 bedroom house with 2 bathrooms is situated in a quiet, tranquil setting. It captures all day sunshine and is a relaxing retreat for your holiday stay. It has expansive harbour views, with several beaches just a few minutes drive away - nearest beach less than five minutes walk away! All have tide concrete boat ramps and great fishing spots. 15 minutes drive to west coast road beach; 15-20 minutes drive to the Lighthouse, and multiple Northern Peninsula beaches such as the beautiful Grahams Beach. 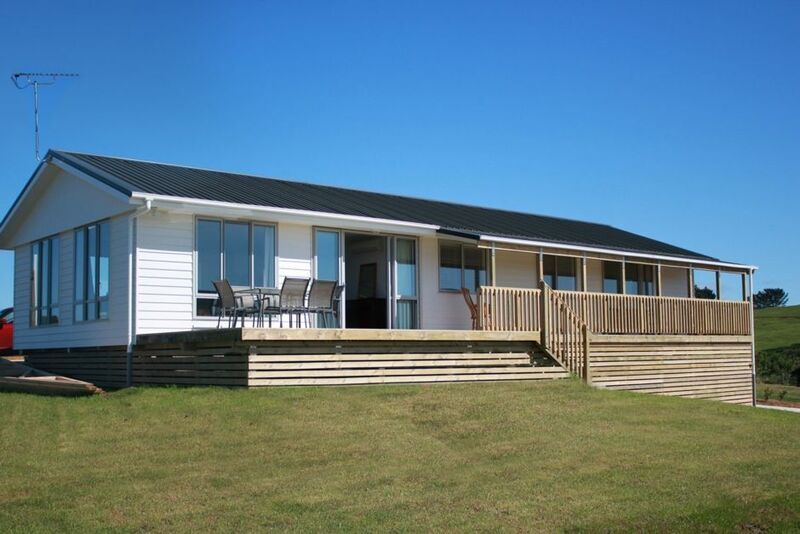 The nearest service station, dairy and takeaways is just a 5-minute drive away; and if anything more is required the township of Waiuku is a further 20 minutes. This northeast facing house is newly built on a very large section with concrete drive and adjoining paddock to kick a ball and play. It has open plan living with sliding doors onto a large recently covered deck and verandah. It has beds for up to nine people; master room with queen bed and ensuite, and another four more large bedrooms containing a queen bed, two sets of sturdy wooden bunk beds and a single bed. There is a large laundry, family bathroom and an open plan living area, well equipped kitchen with everything you need for your comfortable stay. 3 bay covered carport right by the front door. ***Please note that there is no barrier/handrail around the part of the deck where the outdoor dining table is, or the back deck/entry steps. If bringing children please be mindful of this. The distance from the deck to the ground is 900mm, which complies with council regulations. ***Duvets/pillows supplied - please bring own towels, tea towels, duvet covers, sheet sets and pillowcases. ***There are no extra charges for cleaning, therefore visitors must thoroughly clean and leave the property as found, ready for the next guests. Nice home elevated with rural views. Great deck and location. Great views, great location, very clean and tidy facilities. Overall, great place to stay. Great communication with owner, house nice and new and very comfortable. Wonderful bach with great views and had plenty of space for our young family. We had a short holiday and we thoroughly enjoyed out time. It is well situated near shops and Awhitu park. We found the beach there the best. Never less there are nice beaches within walking distance. The house has loads of rooms and even some toys for my toddler to play with. Yes you have to keep an eye out for the open deck. But that was well explained before hand and I had no issue with it. The kitchen has basic cooking equipment, there is also another fridge in the laundry...which is perfect. We would happy come back. Thank you to our hosts.